I often have the need to do a quick search of the exact relationship between myself and someone else – a relationship finder. How do we connect? What ancestral pair begot our parts of our family tree? Had an interesting question come up today about one of my Ancestors, John Stoney. The Gentleman who contacted me said his Stoneys were also from Knockshegowna, Tipperary, Ireland but he had no idea how we might connect. Immediately my mind went to, “well have you (the Gentleman with the question) done an auDNA test? I have and so has my dad. Using our auDNA information we might be able to define the possibility that my John Stoney of Knockshegowna is related to his Stoney’s of Knockshegowna. Notice that I do have some DNA confirmed status marked? It’s because I have been able to confirm those genealogical paper trail relationships via the DNA of some close shared cousins with my great grandfather Christopher Lee Templeton. But all the way back to John Stoney? No confirmed status indicators…yet. So I know that I am genetically distant from John Stoney by 7. this is a genetic distance of 7, starting with 1 at my father. 7 is a long way genetically from me for auDNA since auDNA has a range back to our 64, 4th great- grandparents. But to my Dad? This might just be doable! Within seconds I know that trying to find a genetic connection between my Stoney’s and the gentleman’s Stoneys of Knockshegowna using auDNA is a possibility. And that if we find some male line Stoney’s of our two family’s to YDNA test, would be a great idea too. 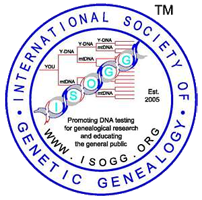 There is no Stoney DNA project at FTDNA and no Stoney’s listed in the Stone DNA Project. Sounds like a project needs to get started, doesn’t it?